Pam Hults has been paper cutting and creating fraktur and original designs since 1979. Her husband, John, has been making her frames, including the painting and graining, for the past 25 years. Recently, they discussed other ways to collaborate with Pam's original paper cutting creations and John’s small wooden furniture, i.e., boxes, shelves, benches and hanging wall cabinets. 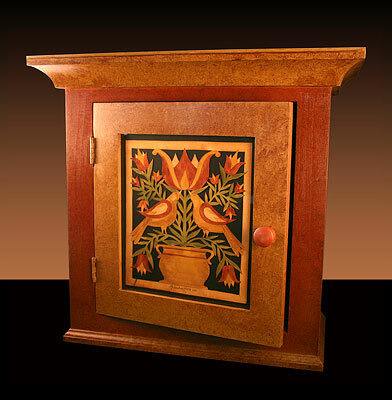 This cabinet is one of the products of their partnership. The paper cutting is under glass, as if a framed piece, in the door of the cabinet. It is a traditional design of two kissing birds on a large tulip and flowered vine in a pottery vase. It is placed on a black foam board background. The entire cabinet is sponge grained with the top and bottom molding painted in Valley Forge Mustard. The cabinet body is painted British Red and the interior is flat black. The cabinet can either be hung on a wall or placed on a table or shelf.